The VEGF ELISA Kit provides a quantitative, competitive detection method for measuring VEGF in serum, plasma, and cell culture supernants. This ultra-sensitive assay measures as little as 4 pg /ml of VEGF and provides fully quantitative results. The ELISA kit is highly specific with 100% cross-reactivity to VEGF 165 with negligible cross-reactivity to related molecules including VEGF 121. 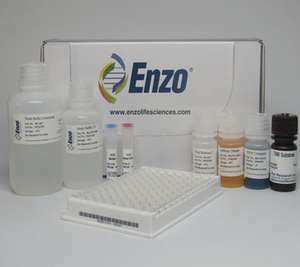 With the ability to analyze up to 38 samples in duplicate in 2.5 hours, these kits meet the needs for rapid, high-throughput analysis.